Starting the morning with a healthy breakfast is a great way to stay on track all day. I recommend eating a healthy mix of protein, fiber, and fat to stay full and energized for hours. Egg dishes are my favorite to get plenty of protein. When made at home, they're nutritious, delicious, inexpensive, and a good choice for those with high blood pressure. These egg cups are the perfect healthy breakfast for busy families looking for something to grab and go in the morning. They’re also a great way to sneak vegetables into your morning meal. Between the eggs, milk, and vegetables, you get plenty of protein, fiber, and vitamins to keep you healthy without raising your blood pressure the way a drive-through breakfast would. The onions and peppers also add plenty of flavor without salt or sodium-laden fatty meats. Heat oven to 350F. Line muffin tins with silicone muffin liners or spray with cooking spray. Divide onion, peppers, and mushrooms between muffin cups. In a bowl, whisk together eggs, milk, pepper, and garlic powder. Pour over vegetables into muffin cups, leaving a little space at the top of each cup. Bake 25-30 minutes or until eggs are set. Remove from oven and let cool. Store in an airtight container in the refrigerator until ready to eat. Use any kind of vegetables that sound good to you. Broccoli, kale, and asparagus all taste great in these egg cups. You can also use any leftover roasted vegetables for tons of flavor! I use silicone baking cups so the eggs don’t stick to the pan. If you don’t have any, you can use metal or paper liners, but be sure to remove them before heating in the microwave. 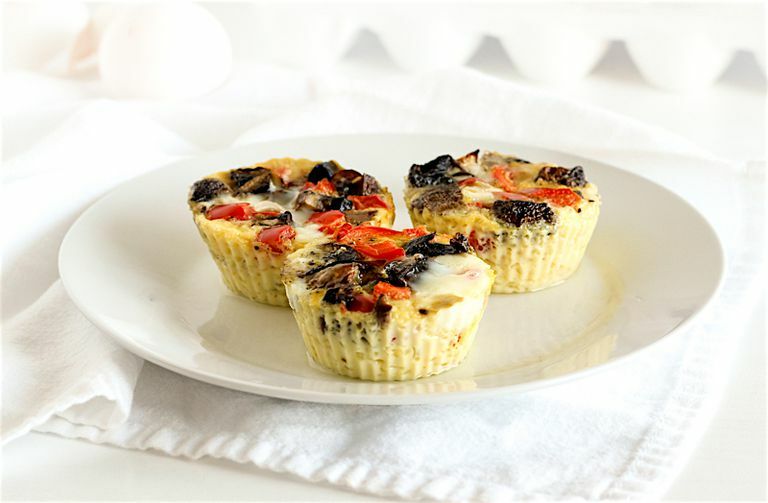 To reheat, wrap egg muffins in a paper towel and microwave on a microwave-safe plate for 30 to 60 seconds. I recommend eating these egg cups with a serving of your favorite fruit and a piece of whole wheat toast or half or a whole grain bagel for a balanced meal. If you’re really in a hurry, you can stick one in the middle of a whole grain english muffin with a slice of cheese for a quick breakfast sandwich. Also, serve with your favorite salsa if you like!